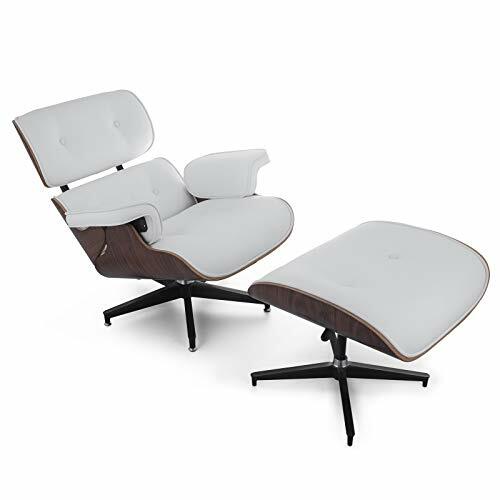 This elegant and beautiful lounge chair is designed basing on the human engineering and suitable for many situations like living room, bedroom and study. The richly hued timber, brownish with darker veining, is often a ideal choice for a serene atmosphere. Relax yourself in the soft cushioned chair NOW! Chair: 32.25″(W) x 32.25″(D) x 33.75″ (H); Ottoman: 25.25″ (W) x 21.25″(D) x 16.75″(H); Color: White PU leather; Material: PU leather + 7 layer plywood. The high density plywood and fine sponge will support and relax your body perfectly, the wide armrests and ottoman will provide enough space for your arms and feet. This Swivel Recliner chair is made of PU leather and 7 layer plywood, and its metal pieces are aluminum. The plywood used in the frame is a strong and sturdy plant with the superior quality of wood for the safety and the stability of the chair.